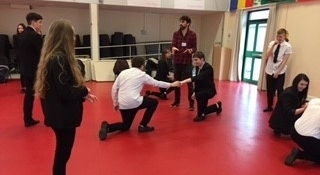 Globe Theatre experts supported around 100 year 11 students at Sewell Park this week to help them understand Romeo and Juliet over five workshops. The Globe Theatre experts not only helped to decode Shakespeare's Romeo and Juliet, they also spoke to the students about how they traveled through education into the jobs they have now. Helen Treutler, Take Your Place Higher Education Champion, said "Shakespeare is a block for many young people but a compulsory text at GCSE level, particularly those who may not have English as a first language. The aim of the day was not only to help decode the language and narrative of Romeo and Juliet but also to talk to students about careers in theatre, working and studying in London. "All in all we're really trying to help support higher grades and students progressing to A-Levels and on to university or other higher education routes including creative and literature. It is great to see a buzz around the school and students really buying into the Shakespearean language"
Head of English, Alexandra Duncan, said ""The students really enjoyed the workshop and bought into the language of Shakespeare. The experts at Globe Theatre really helped to de-mystify the language and bring it to life. Putting this into the context of progressing to higher education, they were able to show how their passion for Shakespeare led them through a higher education route to a career they care about."